Support the up-coming Youth Activities! Our Youth Ministers, and Youth Leaders mission is to introduce children to Jesus Christ at an early age. This is to transform their lives by encouraging them to develop a personal relationship with God our Father. This is accomplished through prayer and a solid foundation of biblical truths. Both Young and Old are a part of the Drama Department at the Mount! 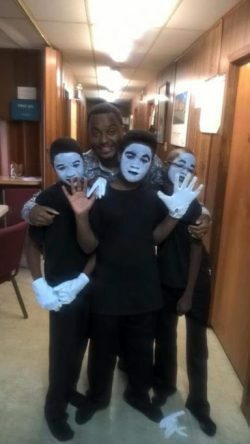 The youth at MPBC are encouraged to demonstrate their gifts through the avenue of singing, drama, artistry, etc. Our children may participate in our Music, Dance, or any other program once they are a member, or request to be a part of a pending activity. For more information please contact our Youth Director. Must be an active member of Mount Pisgah • Meet all requirements necessary to service children • Be faithful and live a separate Christian life. For more details about how to become a MPBC Youth Volunteer, please call 501-982-6215, or email: info@mtpisgahjville.com. Sis. Angela Lemmons – Youth Director: My name is Angela Lemmons, I am 46 years old and have two lovely children, Deshauna and Angelo and a wonderful husband, Pierre. I graduated from Jacksonville High School and I still live in the Jacksonville community. I am the Youth Director at the Mount Pisgah Baptist Church and I enjoy working with youth of all ages. I have been employed at the Little Rock Job Corp Center as Dean of students for the past 18 years, where I work with at risk youth, ages 16 to 24. I love to write poetry and sing and dance, but my passion is bringing other people to Christ.